Next Friday, my family and I will fly to China for a couple weeks. If everything goes as planned, we'll come back with an adoptive daughter! We've been on the waiting list to adopt since 2005, and the waiting times have grown longer and longer. Originally we thought we'd travel in summer 2006. We've been waiting on tenterhooks ever since, and yesterday we finally got definitive permission to travel. So we have a week to get ready for a two-week trip to China and for a new baby in the family. With that, and the term still in full swing, I'm afraid the blog will have to languish a bit. I hope to be able to post a couple things from China, but I'm not sure I'll have the opportunity: Last summer a reader told me The Splintered Mind is blocked there. Is Philosophical Moral Reflection Behaviorally Inert? Regular readers of this blog will know that I'm interested in the moral behavior of ethics professors -- and why, in particular, it doesn't appear to be any better than that of non-ethicists of similar social background. One possibility is that philosophical moral reflection is behaviorally inert. In conversation, I've found that philosophers are often quick to endorse that idea. Maybe I haven't done a very good job of articulating what I find unattractive in that view. Let me phrase my concern as a dilemma: Is philosophical reflection about ethics different in this respect from everyday moral deliberation about what to do? If no, then the view being espoused is dark indeed: Moral deliberation, in general, is behaviorally inert. When we think morally about what we are obliged to do, the resulting judgments must either simply justify what we were going to do anyway, or if they don't match our prior inclinations they must be cast aside as we go ahead and act contrary to them. Of course such things sometimes happen -- maybe even the majority of the time -- but to think that such a result is inevitable undermines the very basis of reflection. We think we reflect morally so that we can figure out what's right and do it (or at least seriously consider doing it); but in fact that project is just a sham. If our aim is to do what's right, there's no point in reflecting about things, no point in trying to figure out what's right. Many of us build our lives as teachers around the falsity of that view. If yes -- that is, if the philosopher who wants to deny the efficacy of philosophical moral reflection thinks the problem is with philosophical moral reflection specifically, not everyday moral reflection -- then some doubtful claims about philosophical ethics follow. While some parts of philosophical ethics are indeed far removed from everyday decision-making (e.g., abstruse metaethical discussions, puzzle cases about runaway trolleys), other parts are much more closely connected to everyday decision-making. Ethicists debate how much we should feel obliged to give to famine relief or other charities, whether we should eat meat, under what conditions it is permissible to lie, the nature and importance of courage. Even those ethicists who don't publish articles on such topics typically discuss them in undergraduate courses. It would be strange if everyday moral reflection about vegetarianism or charitable donation was causally efficacious but philosophical moral reflection about those same matters was not. It's hard, even, to see what the difference between the two is, other than that the latter may be more formal and detailed. Maybe some of you can help me out: What's so attractive in the view that philosophical moral reflection is behaviorally inert? Why are so many philosophers seemingly attracted to this view, when confronted with my questions about the morality of ethicists? Friday and Saturday, the UCR Philosophy Department hosted its annual conference. Eminent scholars traveled from afar to address the conference theme: the self. Through it all, I felt unmoored. What is a self really? I'm not sure how we are to go about answering such a question. I believe it's a great mistake to plunge into metaphysics with intuitions about what it sounds right or wrong to say as one's only guide. First, one needs a sense of why we care. What is the purpose of the account? Do we want to know who to punish after a crime? Do we want to know why we should save for retirement? Do we want to know how an animal knows not to eat its own limbs? With no practical or empirical grounding, it's all just puffs of fog. Few works of philosophy are more perverse than Norman Malcolm's (1959) Dreaming, in which he argues that dreams do not occur when one is asleep and contain no feelings, imagery, sensations, or the like. Malcolm's view, rather, is this: When we wake, we're inclined to confabulate stories of a certain sort. Telling such a story is what we call "relating a dream", but there is no sense in which the dream exists independently of or prior to the story we tell about it, and no sense in which such a story can be evaluated as an accurate or inaccurate description of occurrences during sleep. Malcolm knew about the then-recent REM research that most people think creates serious problems for his view. He cites and dismisses, on what seem to me flimsy grounds, Dement's research suggesting that reported dream duration on waking matches duration of REM sleep and his very suggestive finding that horizontal movements of the eyes during REM sleep correlate with dream reports of horizontally-salient events (such as a tennis match) and vertical movements of the eyes correlate with reports of vertically-salient events (such as climbing a series of ladders, looking up and down them). In a dream I can do the impossible in every sense of the word. I can climb Everest without oxygen and I can square the circle (p. 57). So here's my question: What does it mean to say one can "square the circle" in dreams? Surely Malcolm doesn't mean that the dreamer can actually coherently conceive of a square circle. That, I take it, is straightforwardly impossible. Somewhat differently, can one violate the laws of math and logic in fiction? Can I coherently tell a story in which 2 + 2 equals 5 (like I can coherently tell a story in which pigs fly)? I'm not particularly well read in the metaphysics of fiction, but my impression is that few philosophers of fiction would grant that -- though if we do grant it, we might be able to use it (with some additional assumptions) to give sense to the idea of squaring a circle in a dream. More likely, Malcolm is expressing the idea that we can reach incredibly stupid judgments in our dreams, even baldly contradictory judgments. I have also long thought this (see section v. of this essay). If we accept this view, it gives more juice to the dream skeptic than she is usually accorded. For if this right now might be a dream, then mightn't also my thinking be so baldly contradictory that I can't even trust my simplest-seeming judgments? The dream possibility calls, then, not only sense experience but also reasoning into doubt. If we allow ourselves the assumption that a faculty frequently unreliable is not to be trusted, there would be no hope that I can rely on my reason to establish the hypothesis that I actually am awake, or indeed anything else. I'm working hard today on graduate admissions and preparing for seminar. No time for my usual Friday post! But maybe I can take this occasion to remind prospective graduate students about my advice for what to do once you hear back. Now if you don't think the parenthetical paragraph is related to the first paragraph, you've never had a stack of 100 graduate applications, each containing a 20-page essay, to evaluate. When Will Ethicists Behave Better and When Worse? Suppose we accept that philosophical moral reflection is bivalent -- that sometimes it leads us toward morality and sometimes away from it. It would be nice to have a theory about when it will do one and when the other. Here's a first thought. Suppose philosophical moral reflection simply introduces an element of randomness into one's ethical principles. Suppose that to a first approximation it's just a random walk away from pre-reflective standards. When conventional, thoughtless, ordinary behavior is morally good (returning one's library books, not pursuing elaborate schemes to evade taxes, waiting one's turn in line), whatever introduces randomness into that behavior is likely to lead away from the good; and thus we might predict that people who do a lot of philosophical moral reflection, such as ethics professors, will actually behave worse in such matters. In other cases, ordinary, conventional, thoughtless behavior might have serious moral shortcomings, such as in the vast overuse of resources by Americans, not donating much to charity, regularly eating meat. In these cases, deviation from the norm might be more likely to be deviation toward the good than away from it. So in these cases, we might predict that people prone to philosophical moral reflection will on average behave better than others. As I continue to reflect on the moral behavior of ethics professors and others prone to moral reflection, I find myself increasingly attracted to the idea that moral reflection is bivalent. Ethicists behave no better than others, on average, not because they don't engage in real moral reflection, and not because moral reflection is inert, but rather because moral reflection has the power both to lead one toward and to lead one away from moral behavior. Moral reflection (in either a religious or a secular framework) can work toward good by increasing one's attunement to the moral dimensions of one's actions; by undermining cheap rationalizations; by helping one see better what morality (or at least one's own value system) requires; and (as Nussbaum and Hume and Mencius have stressed) through imaginatively extending one's sympathy and understanding. However, moral reflection is also a tool of rationalization -- and the more skilled one is at moral argumentation, the more readily one can find rationalizations for what one wants to do. Suppose you unintentionally walk out of a library with a book, forgetting to check it out. You're not caught. Months later, you vaguely consider whether you should return the book, or whether you should just keep hanging on to it. Any philosopher worth her salt could construct a bevy of rationalizations. Conventional thinking seems to demand returning the book. (In fact, I've found that ethics books are more likely to be missing from academic libraries than other books.) Conventionally, one should not engage in sexual relationships with one's students, or outside one's marriage. A danger of independent moral thinking is that it invites self-serving rationalizations for setting aside convention in one's own case. (I'm reading a biography of Einstein, who complacently justifies his extramarital affairs, painful to his wives, with a theory of the natural non-monogamy of men.) Of course, not reflecting morally has its moral dangers, too! Whether reflection or its absence is more apt to lead us astray is an unsettled empirical question. My sense, both from personal experience and from empirical research, is that it's roughly a tie. Suppose we grant all this. The question then becomes: Under what conditions, or with what supports, does moral reflection promote rather than impede moral behavior? Okay, time to tilt against the windmills -- actually just one small, stupid windmill. But it's a windmill that particularly raises my hackles because it brings together my distaste for ignorant distortions of stock phrases with my interest in the history of psychology. 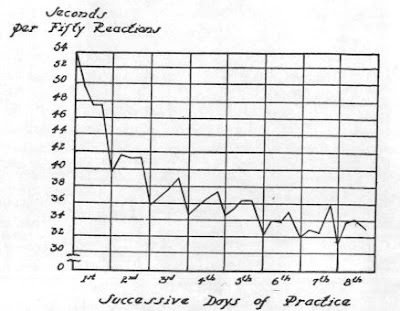 Now consider this: If the curve were steeper, would that mean subjects were learning more quickly -- i.e., that the task was easier to learn -- or would it mean that the subjects were learning less quickly and the task was harder? Next time you hear someone talk about a "steep learning curve" to mean the opposite of its proper meaning, tell her you're going to hackle her tilted petard! Does the Sun Look One Foot Wide? Aristotle says that the sun looks one foot wide (De Anima 428b, On Dreams 458b). Writers in later antiquity repeat this claim without challenging it (e.g. Cleomedes II.1), though they are troubled to explain how it can look one foot wide given how far away it must be -- hundreds of meters at least! Their assumption seems to be that there is some illusion or trick of optics at work. Do stars look tiny? Do people look no bigger than ants when you stare down at them from twenty stories up? People say these sorts of things, but how literally should we take them? Maybe the people below look normal-sized, but only very far away -- far away enough that there's something unusual about how they look that tempts us to say they look tiny, though really that's not quite the right way to describe how they look. If we say simply that the skyscrapers look like large things far away, then I wonder two things: (a.) Why are we tempted to say they look small? (This temptation manifests itself cross-culturally, e.g., in the ancient Chinese philosopher Xunzi); and (b.) What do we do about outright illusions? You know the line is straight, but it still looks crooked. Right? Likewise, could it be that although I know the skyscrapers are large they still look small? Surely it's too purist to say things never look other than how you know them to be. There are outright illusions with distance -- things looking smaller, in an illusory way, than they actually are. (This is part of why we often badly misjudge the speed of large, far away things.) Such illusions should have a different effect on the visual experience of size than does the non-illusory visual experience of "smallness" with great distance, if the advocate of the view that skyscrapers look like large things far away is right. But I'm I can't seem to find in myself the required difference in visual experience. Should I then simply get on board with saying that distant objects look small? Among other things, I worry that the geometry of that view will lead us ultimately to say that things far away look simply flat (or concave) -- with the unpleasant consequence that a far-away road receding to the horizon looks like it goes straight up. That couldn't be right, could it? UC Riverside philosophy grad student Alan Moore pointed out these YouTube videos to me, of a fellow (Daniel Tammet) who recites pi from memory to more than 20,000 places without error. The videos also show him doing multiplication in his head into the hundreds of millions. The videos are fun and suggestive, but I'm also struck at how creduluous the researchers (Ramachandran less than others, maybe) seem to be about Tammet's phenomenological reports of how he does such incredible calculations -- by fitting together imaginary shapes in his head. Is it even topologically possible to model multiplication in this way? That's not obvious. And the direction of causation is open to question -- do the images lead to the answers or do the answers lead to images? And if we come inside the zone of perfect stereoscopic vision [i.e., closer than about six inches] (a region too little explored by philosophers) we find that there is indeed a correlation between depth and sensible size, but it is the other way about; the smaller the depth, the smaller the size. 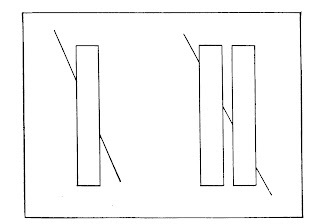 Thus if I bring a match-box up to the end of my nose, the top surface is manifested by a trapeziform expanse having its longer side at a greater depth than its shorter one: the box has rather the appearance of a wedge, whose 'thin end' is directed towards me. A surprising claim, and not one I recall reading elsewhere! I'd be interested to hear if the readers of this blog share Price's sense of this. Suppose we call "visual arc subtended" the amount of the visual field some object occupies, defined geometrically by how much surface area the object would occupy if projected onto a sphere centered at the eye. As an object approaches the bridge of my nose, the visual arc subtended increases dramatically as it moves from about twelve to six inches; but in the last two inches or so, there's not much increase. I don't think that can be Price's point, though: First, there's a simple geometrical explanation for the fact about visual arc. Within the last two inches, bringing the object closer to my nose does not actually bring it much closer to either eye. If I instead bring the object close to the pupil of my dominant eye, there is no slowdown in the increase in visual arc subtended. And second, Price emphatically does not think that apparent size changes when objects move around within the zone of perfect stereoscopic vision -- such as from twelve to six inches -- though the visual arc subtended obviously does increase. So what Price is after here is not, I think, a matter of visual arc.